I realized something recently about myself and my relationship to dance and my offering of dance to other people. I realized that the most important thing that I want to offer with dance is fun. Now, fun expresses itself in many different ways depending on who I am teaching. Fun for some can be the excitement and enjoyment of learning something new, picking up a new skill, discovering you can do something you thought you had lost when you were 6 or 7, learning new movement you didn't think you were good at, performing in front of an audience for the first time or for the 50th time, realizing you can exercise your body and your brain at the same time, surprising an unsuspecting crowd with dance, reigniting passion for dance, exploring how to strenthen your technique to make something more crisp and clean and inviting, learning how to really connect and pull an audience in wether it's one person you're dancing for or 200, dancing because it makes you feel empowered, creates a better self image and body image, exploring a new, exciting side of yourself, challenging yourself to do something new because you know it's exactly what you need, and just moving because it feels good! I love that dance is so big that it can connect with people in so many different ways. I do believe that everybody is built for dancing. Yes, we use our bodies to walk from place to place but I can't think of a better way to appreciate your body than to dance with it. Say thank you to your body and dance with it! New tag line? All of you can dance. ALL of you. And all of you can enjoy dancing. ALL of you. That doesn't mean that you have to enjoy dancing to 80's music or like dancing in a night club or like dancing the way other people dance. Your "dance fun" is unique and if you think you don't like dancing I would like to be so bold as to say I feel you have not yet found your very own "dance fun". I'm here to help, in the service of fun! At your service! I've had such great couples to work with this wedding season and even several groups, and in this one instance the two of them came together without any of the parties realizing we were all connected! It was a really fun, magical coincidence to discover. "What a huge surprise when my friends started circling us. Their dance truly was THE HIGHLIGHT of the night. I can't begin to tell you how much that meant to us and how fun it was. I couldn't take it all in that night but I've watched the video over and over and feel so loved every time I do. Thank you! Thank you! You did have a great group to work with." OMG, how cool is that! I had no idea I was creating a dance for people to surprise people I was making a dance for! So many dance surprises! Kim and Scott surprised their friends, their friends surprsied Kim and Scott, and I was surprised by all the surprises surprising me and coming together in such a synchronistic way, and somehow I find the ability to like my job even more! And we even have the video to prove that the dancing everybody was talking about actually happened! Good times. Coming soon: Blogging about another First Dance and flashmob I did for a good friend's wedding, 90's, EZ Rock and Rob Base style! "I can't even remember what we danced to." Don't Let This Be You! I can't even tell you how many times I've heard this from married couples! They often follow, "I can't even remember what we danced to." with, "Your service wasn't even available when we were getting married." Aren't you lucky! Now it is! I love being the one to remind couples that they're going to be in front of all their loved ones dancing. But I can't reach out to ALL the couples getting married this year. I know it's not always the first thing couples think about when planning their wedding. Oh, so many details! It's an ongoing challenge to not get swamped by all the details. That's why I'm here to help remind people that YOU WILL BE DANCING, (unless you've opted out of the First Dance) and it's going to be fun and I want to help make it memorable! You remember to plan for your dance three months ahead of time? Way to go! You remember to plan one month ahead of time? OK, you still have time! You remember a week before your wedding? Hey, you know what, not exactly the most ideal but absolutely doable. I've done it before and have been blown away by how much couples have been able to pick up in two lessons. Just last week I worked with two couples that were getting married within that same week that we met and they rocked it! They dipped, and turned, and foxtrotted and waltzed with ease I didn't realize was possible in just two lessons. So, if you're afraid you're too late, you're not! Unless you're already married; good reason to renew your vows if you ask me. "I loved our First Dance! We still do it out at da club." Let this be you! Most interesting period in the history of dance is the 1920's. At least that's what I think now! I've recently been really interested in Lindy Hop swing dancing. It all started in the 1920's in Harlem with African American men performing solo, a technique that's now called Solo Vintage Jazz. Those solo moves eventually turned into partnered dance we now call Lindy Hop. I began dancing when I was three years old. My mom has a picture of me when I was that young bending over touching the floor with my legs straight. Flexibility definitely helps. Josephine Baker is an inspiration and Hot Stuff! Dancing alone is actually my favorite. I can be as expressive as I want and really pay attention to how my body wants to move. Dancing with someone can be extremely satisfying especially if there's that mysterious thing that between the two of you that creates a connection. If you're both really listening to each other (body language), no it's not just the follows job to listen to the lead, it's a two way street, then magic happens. My favorite smell is probably magnolias. When men dance with women it's best if they communicate and respect each other's part in the dance. Hmm, sounds like something that applies to any relationship. Dance is excellent relationship practice. That's why it's so great for couples to work together on their First Dance for their wedding. It's the best therapy! The tango, specifically the Argentine Tango is also hot stuff. It's a very challenging dance to learn but I love the sensual nature of it. This dance, more then others, forces you to be extremely present with the person you're dancing with. That's why I like it. Dancing shoes or bare feet! I majored in Modern dance in college so I'd say I'm most comfortable with nothing on my feets. Second best would probably be light weight sneakers with smooth bottoms for easy turning and moonwalking. Choreographing wedding dances feels like an honor. I feel like I'm helping couples really own their wedding day, because it's not what their parents wanted or their other parents wanted it's what they chose to work on together. They put lots of time and effort in to creating something special and personal, just the two of them. And their friends and family recognize that and fall in love with them even more! Best place to dance in Asheville is Bobo's on Friday night!! Micheal Jackson rocks my world. I can't wait for them to figure out his death was a hoax like they did with Elvis. I learned the most about movement from my teachers at UNC School of the Arts and my summers at American Dance Festival. It opened my eyes to how many different things there are to explore in the world of dance. It's so inspiring to see what people are doing with dance. First part of the body that moves when someone begins to dance is. . . well, my friend told me he read somewhere that women are more attracted to men that move their upper body when they dance. I think that's funny but for the most part rings true! I think a good place to start is the hips, right Beyonce?! Yes, someone blogged about me and I Do Dances and I'm blogging about how they blogged about me! In case you didn't see their blog you can look on my blog for their blog. Blog blog blog. It's a really fun word if you say it enough. A very special thanks to photographer Jennifer Callahan for her interest in my business! "Asheville Indie Weddings is the first bridal blog to focus on unique local artists in our community, showcasing businesses brides might not come across otherwise. The blog will give you an insider's view of what you'd love about Asheville, if you're new to it's charms, and things you'd be disappointed to miss if you're a local. After all, doesn't everyone want a wedding in Asheville to be as unique and special as Asheville itself? This blog will help you find offbeat and up and coming professionals and give you ideas about how to plan an artful and modern event in our progressive mountain town." Go check it out! Yes, go! Last month someone called to ask if I could come to their nine year old's Birthday party and teach her and 10 of her friends a hip-hop dance to (one of the nine year olds favorite dance songs) Willow Smith's "Whip My Hair". Well, yeah, of course! I love kids. I love watching them dance. I love to see how they interpret the movement I'm asking them to do (interpret because it doesn't always look exactly the same, which I love!) I had a blast. I think it's such a great idea for a Birthday party. It felt special to the Birthday girl, her friends were really in to it, they got to move, perform it for their parents and then eat more cake. I can't wait to do more! I will hopefully have a video of their cute performance coming soon. Oh my goodness it's been so long! What have you all been doing for entertainment with my several month hiatus? With the Holidays and couples starting to plan for their 2011 weddings I haven't found the time to write but now that I have the time I wanted to tell you about a couple I worked with in December. Laurie and Greg live in Atlanta and were travelling to Asheville to get married at the Biltmore Estate. I received a call from Laurie on Thursday. . . they were getting married that Sunday. That's right! They needed help and fast! We had three days to pull it together and that's what we did. They chose Jack Johnson's Better Together for their First Dance song. Neither of them had prior dance experience. They were both a little nervous especially with the added stress of the time crunch. Man, I wish I had taken a picture of them the first day they rehearsed and another one on the last day. I was incredibly impressed with how much they were able to pick up in three lessons. People keep amazing me, that's why I stand strong in my belief that dance is innate, instinctual, we just have to remind our bodies of that. They learned 2 and a half minutes of choreography in 3 lessons! Two minutes may not seem like a lot but believe me, from dancing my whole life, it is, to not only teach your body to do the movement, in connection with your partner, but to also REMEMBER it. It is a feat! That's why their faces, their bodies, their mood were completely different the last day because they had overcome the hurdles of learning a dance and it felt good, really good! They were excited and confident. I was excited and proud and excited. It's really wonderful to see people succeed at something that is completely new and different and challenging to them. Congratulations to Laurie and Greg for taking the risk to try something new. Have you tapped in to your innate dance potential lately? 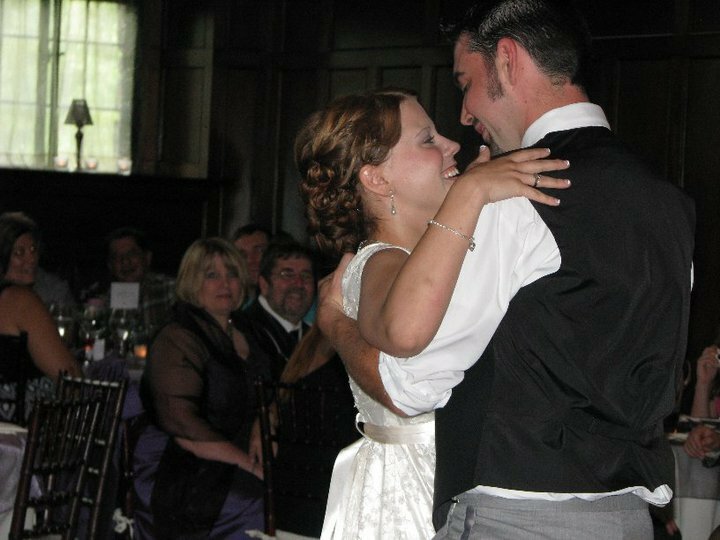 Curious what a rehearsal DVD of your First Dance would look like? know the choerographed First Dance is still somewhat of a new concept to a lot of folks. What might be even more foreign is doing a lot of rehearsing on your own from a super accessible instructional DVD. I want to make this concept more accessible. What I do is I meet with a couple to get to know them and to see them dance a bit. I then choreograph a dance to the song they've picked out, teach it to my dance partner and then make a DVD for them to practice with on their own. We meet with them for a 2 1/2 hour rehearsal to make sure they feel comfortable and confident executing all the moves in the dance and then the DVD is a helpful reminder they use to memorize their dance and work on details. The couples I've worked with have found it really easy to use. It works, it works! You don't have to spend hours and hours in a studio with a teacher. Instead you get to spend hours and hours with your honey learning something new together. Come on, that's romantic. Here's a taste of what the video would look like. We do the dance three times; first with music, second with music while I also shout out certain lyrics of the song that match up with specific moves (easy way to memorize), third is an instructional talk through of the entire dance. Take a looksy. Excerpt from one of our instructional DVD's from Kathleen Hahn on Vimeo. What, you didn't meet under the stars with moonlight in your eyes and the most amazing song playing in the background that was the catalyst for you falling in love??! That's hard to believe because it happens all the time in the movies! Perhaps it's a generational thing but it seemed like in the 50's (movies I guess since I wasn't alive then) everyone knew what their song was as a couple. It seems to be less common now possibly because music is around us all the time, in shops, grocery stores, dentist offices, at work, so it's not as momentous of an occasion when you're with the one you love and music is playing. So, what does this all mean? It's harder to find a First Dance song! I guess everything's harder in real life then it is in the movies. You are not limited! There are millions of songs to choose from. Don't hold back from choosing Marvin Gaye's Let's Get It On if that's what you two really love and enjoy for whatever reasons. Don't feel obligated to choose a song from the somewhat short list of "acceptable", "traditional", "wedding song sounding" songs. Overwhelmed? You love lots and lots of different types of music? Here is a site that has some great ideas that go beyond the generic choices: Offbeat Bride , or if you're looking for something more traditional or popular look here: Top 115 Wedding First Dance Songs. My new favorite at the moment, in the sweet, charming category, is Pretty Flowers sung by Dolly Parton and Vince Gill, written by my husband in a past life, Steve Martin. I will be adding a new section to my site of songs I have choreographed to for couples. Check back! Have fun listening! Here are some pretty pictures of Nicole and Jason dancing on their big day. It sure does make me happy to see such huge smiles on people's faces while they're dancing. Looks like, and sounds like, they had a good time: "The dance was wonderful. We had a lot of fun!" -NicoleHooray for love!